Home / Asamoah Gyan / Entertainment / news / StoneBwoy / Zylofon Media / Asamoah Gyan To Bailout Stonebwoy From Zylofon Media? 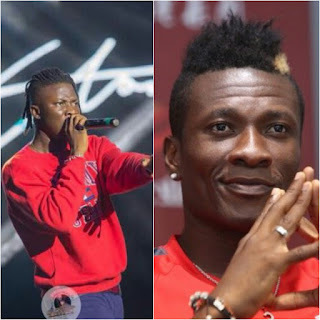 Asamoah Gyan To Bailout Stonebwoy From Zylofon Media? For almost a week now, there have been countless rumours that Bhim Nation Boss, Stonebwoy may likely leave his record label, Zylofon Media before his contract with the record label expires. Stonebwoy joined Zylofon Media in August 2017 under undisclosed terms of an agreement. Recently, Shatta Wale, the self-acclaimed Dancehall King joined the same Media house in a 3-year contract on 31st January 2018 in a huge funfair. As we speak, the rumours are getting thicker by the day and his[Stonebwoy] fans have called on him to leave Zylofon Music because they believe Stonebwoy is not being accorded the respect he deserves at Zylofon ever since Shatta Wale joined. It’s hard to conclude at anything at this stage but reports gathered by Dawuroo.com reveal that Stonebwoy will be organizing press conference very soon to make his decision to part way with Zylofon Media publicly. And one thing we know for a fact that, if Stonebwoy decides to terminate his contract with Zylofon Media, abruptly without any valid claims, he would be expected to pay a fine. Although Zylofon Media refused to give the details of the contract between them and Stonebwoy, we can exclusively tell that his deal was for a 3-5 year duration and in order to foster understanding, and arrive at what to do when there is a breach of contract, an insider has hinted that, should Stonebwoy decide to leave Zylofon music over such minor issues which could be resolved easily, he would need to pay an amount of money to Zylofon as outlined in their exit clause, which both parties have signed to. So what will be the bailout amount Stonebwoy must pay should he decide to leave Zylofon Music? From speculations, Stonebwoy was signed for some $1.5 million, an amount that enticed him to join the label, he would be expected to pay not less than $2million back to Zylofon, should he decide to leave the record label. So will Stonebwoy ever decide to leave looking at how much he would have to pay as his bailout? Are the rumours that Asamoah Gyan would be the one to bail him out also true?